Quantative Easing (printing money in 2013 to help economy), was done to keep interest rates down. In November, interest rates went up, business conditions believed to improve. However, sales activity has been rising, consumers think it is a better time to buy a home. The Stock Market is much higher than 1 year ago. Consumer Confidence is also much higher since the election. Higher mortgage rates have not affected home buying. 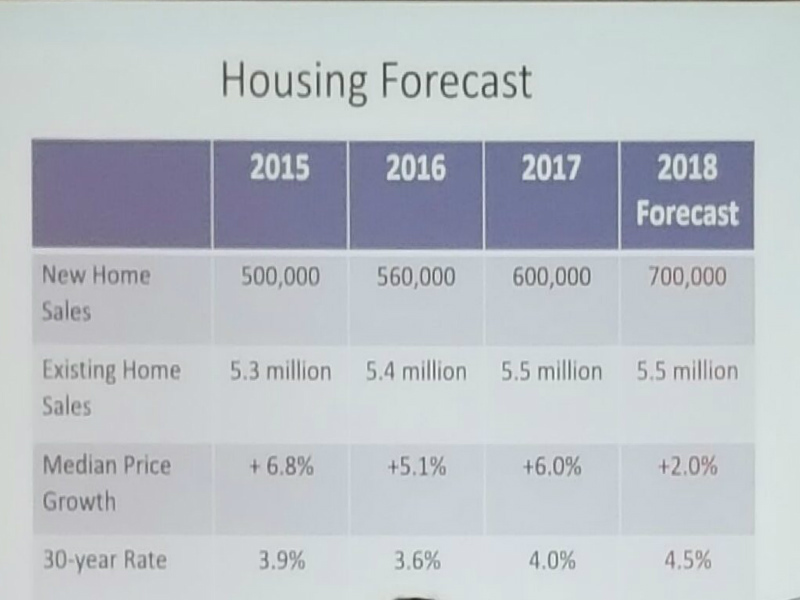 Home prices are also rising nationally but in New London County the rise is much more modest, perhaps explaining why homes are selling better in eastern CT than western CT.
Income is increasing but not as fast as home prices. The difficulty in saving for down payments is slightly increasing. Inventory of homes for sale is very tight in Eastern CT compared to western CT.
Actual tenure in homes has been increasing from 6-7 years to around 10 years. Pent up seller opportunity exists. Builders have been under the 50 year average for new homes. Home ownership has been declining, while renting has increased. Home ownership builds wealth but renters are being denied the opportunity, especially those people with student debt. The housing market is much healthier as foreclosure rates decrease. CT traditionally has had lower rates than the national average until 2011 when the national average went lower than the state average. Tax Reform was put in place to improve the economy. 2018 looks like GDP will top 3%. Nationwide job rate growth is rising dramatically compared to the flat line of Eastern CT. Job openings for the country is sky high. Unemployment nationwide is at historic lows. Commercial investment has been good for software and equipment but slow for buildings. Export and import are both rising but exports are not keeping pace with imports. There is a Commercial Real Esate construction workers shortage. A concerted effort is being made to improve the image and enrollment of trade schools to fill the well paid construction worker jobs shortage. Inflation is starting to be a concern. Quantative Easing is starting to sell money instead of printing money, meaning interest rates are being raised. The Federal Reserve has raised the interest rates and they are anticipated to increase as the year goes on. A 5% mortgage rate is also anticipated which is still a very good rate historically but higher compared to recent trends. Renter’s ages have been increasing but should level off inceasing the number of potential home buyers. Cap Rates (NCREIF) are historically low because commercial investment had been rising. Quantative Uneasing is a factor. With the slowdown of Commercial Investment owners will need to either raise rents or lower sales prices. Builders will focus on lesser priced homes due to the tax changes on higher priced homes. Lower priced homes are in demand raising their prices. Stock market volatility in the short term is not a concern to economists as the long term outlook has remained strong. Historically low interest rates and a shortage of inventory are making for a good sellers real estate market in eastern Connecticut. Next: Why are home prices on the rise?